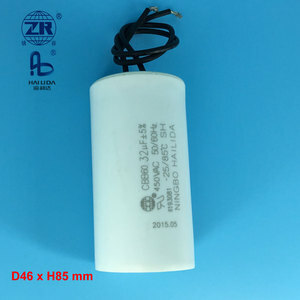 The little sample cost can be free, the large quantity samples,can be negotiable. 2. Advanced production facilities and inspection equipment. 3. Fast delivery ad large production capacity for big orders. 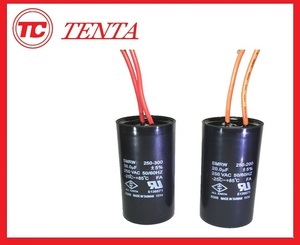 NPO, N750, SL Change of Capacitance C &gt; 30pF, &pound; &plusmn; 3%. 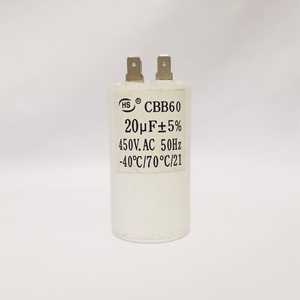 The capacitors shall meet following after 24 hours exposure at room temperature. Temp. Char. 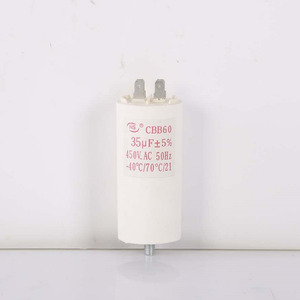 NPO, N750, SL Change of Capacitance C &gt; 30pF, &pound; &plusmn; 5%. 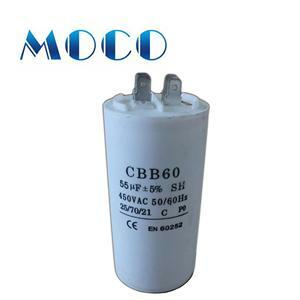 Capacity(&mu;F) 450VAC 250VAC D H D H 3uF to 7uF 25 57 6uF to 8uF 30 60 6uF to 8uF 35 60 8uF to 12uF 35 68 25 57 8uF to 15uF 40 60 9uF to 12uF 35 73 9uF to 15uF 35 58 9uF to 16uF 39 69 10uF to 15uF 35 68 10uF to 15uF 40 70 35 60 10uF to 18uF 8 70 35 73 10uF to 20uF 40 92 15uF to 20uF 42 85 34 70 15uF to 20uF 40 60 16uF to 20uF 40 70 20uF to 25uF 45 69 25uF to 30uF 45 93 45 69 25uF to 35uF 50 80 30uF to 40uF 50 85 40 92 30uF to 40uF 50 92 50 80 30uF to 40uF 42 85 45uF to 50uF 50 100 45 93 45uF to 60uF 50 84 60uF to 80uF 50 92 Remarks:lead-out(for wires),double wires,cable,two pins,four pins(with screw)D-diameter H-height cbb60 motor run capacitor 450v APPLICATION: 1.Apply to 50/60Hz a. c single-phase motor for starting and running 2.Apply to for micro water pump,cleaning machine washing machine 3.Apply to single-phase water pump motor cbb60 motor run capacitor 450v PRODUCTS CHARACTER: 1. 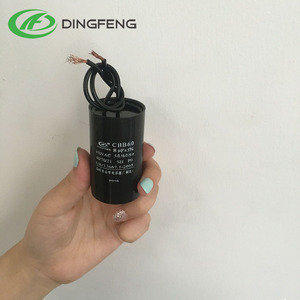 Plastic cylinder out-shell are fireproof,sealed by resin with lead-out structure 2. Small,light and good self-healing 3. 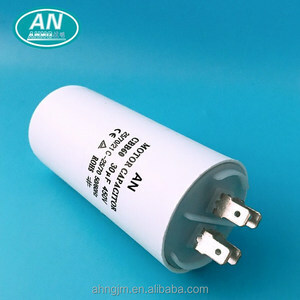 Make the use of ZnAI edge thickening metalized film,can bear Impact current. 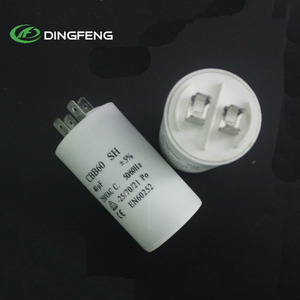 2.Delivery Detail: 2-10 days after received the firs t deposit Shenzhen ChuangShiDing Electronics Co. 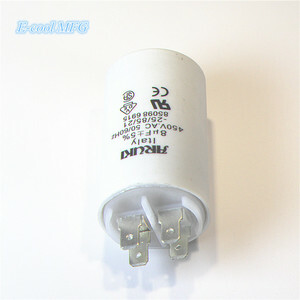 The raw materials are imported from the famous brand company in Japan, German and Korea. 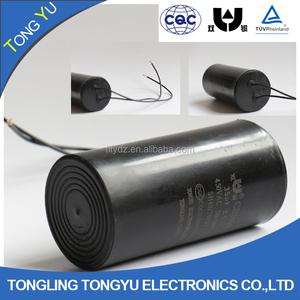 We also established the long term strategic cooperation partnership to ensure products quality.